As of May 2019, there will be a new registration notification pathway allowing medical device manufacturers to access the Brazilian market quicker. 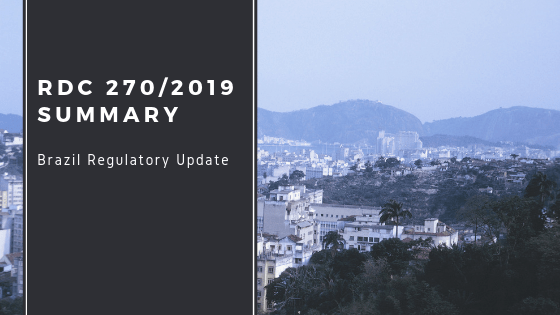 The recently published RDC 270/2019 establishes this new notification pathway specifically for Class 1 Medical and IVD devices. These manufacturers may no longer have to undergo the complete ANVISA registration process. There will be no prior technical analysis of the notification requests required for the Class 1 products to be considered regularized. However, ANVISA reserves the right to conduct document or tax evaluations on the notification processes and any related changes at any time. Manufacturers of low risk Medical and IVD devices may begin marketing their products in Brazil after receiving notification numbers and including them on their product labels. The publication of the notification number will occur routinely within 30 days after the submission date and payment of the fees, regardless of documentary analysis by ANVISA. The new pathway does not change the required documentation for Class I medical and IVD devices who are currently on the Cadastro registration route. Instead, these manufacturers will be notified to ANVISA to be issued notification numbers.